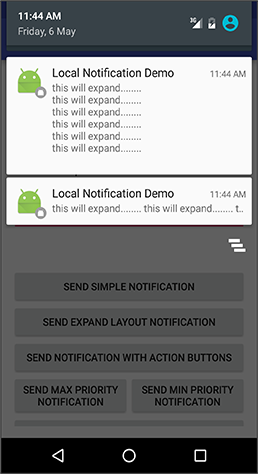 The Main Objective of this blog post gives you brief idea about how to implement local notifications in android. Local notifications is used for notify user about your application’s updates or news. 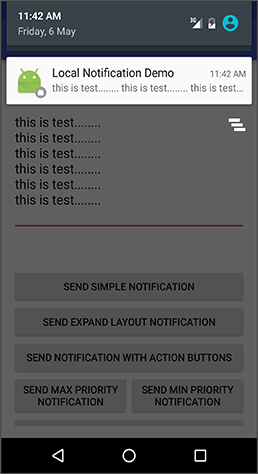 I will teach you how to implement local notification in your android application. Before moving forward, I would suggest you to refer Android Notifications. Follow these simple steps to create a local notification in your Android App. Now, in this blog I am taking notification title and notification description from user. I am done with my layout and I have taken all string reference in strings.xml. Put strings.xml file on following path app >> res >> values >> strings.xml. So my strings.xml file will look like this. In strings.xml file I have declared button texts and edit text hint. I am done with my layout file, so now let’s move towards the coding part of the application. Now, let’s understand MainActivity.java step by step. In getAllWidgetReference() method I have taken the reference of edit texts and buttons that I have taken in layout file and I have assigned notificationManager variable for the notification service. I have created a bitmap image of my application icon for notification Icon and assigned it to the icon (Bitmap variable). In bindWidgetWithAnEvent() method I have assigned what action will be performed when user clicks the button that I have created in the layout. setNotificationData() method will set a title and description of the notification. I have taken notificationTitle and notificationText variables for Notification Title and Notification Description respectively. If there is no text in notificationTitle edittext then it will take default title text (here I have taken app name as a default title) and same as notificationText. You need to call sendNotification() method after setting notifiactionBuilder object as per your need. In this method I have defined Intent and PendingIntent object to redirect user to some activity when user touches the notification. To assign some action when user touches the notification, I need to set PendingIntent object in notificationBuilder.setContentIntent() method. If I don’t define notificationBuilder.setContentIntent() method then it will do nothing when user touches the notification. In Intent object (here notificationIntent) I have defined MainActivity.class so it will be redirected to MainActivity of our app when user touches the notification. For more detail about pendingIntent.getActivity() refer this. This method is responsible for sending notifications to the user. For more information about NotificationCompat.Builder refer this. After Setting all the things just change the notification builder object to get different types of notifications. To send the simple notification to the user just set the notificationBuilder object as follows. This type of notifications cannot be expanded. 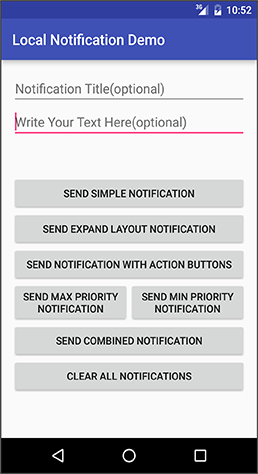 To send the Expanded layout notification to the user just set the notificationBuilder object as follows. To add action buttons in the notification, just follow these simple steps. 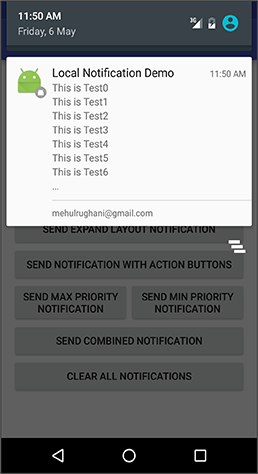 After setting notification builder, create pending intent for button actions. Here when user clicks on YES action I am setting intent action to yes and for NO action I am setting intent action to no. So that in AnswerReceiveActivity I can get action name by getIntent().getAction() method as shown below. Now I am creating empty activity named AnswerReceiveActivity. android:text="You have selected : "
Here I have given the example of PRIORITY_MAX and PRIORITY_MIN. To set priority you just need to set setPriority() of notificationBuilder object. 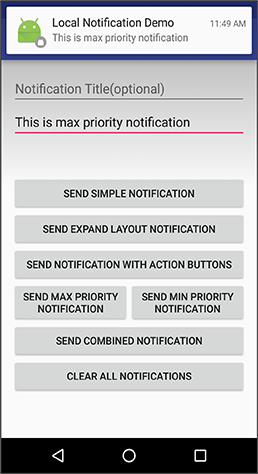 PRIORITY_MAX Use for critical and urgent notifications. PRIORITY_HIGH Use primarily for important communications. PRIORITY_DEFAULT Use for all notifications that don't fall into any of the other priorities described here. PRIORITY_LOW Use for notifications that you want the user to be informed about, but that are less urgent. 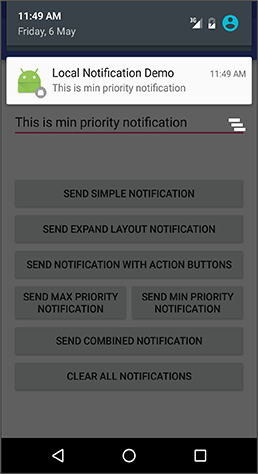 PRIORITY_MIN Use for contextual or background information notifications. You can combine multiple notifications in to one notification. Each time when I click send combined notification button, one notification would be added into the previous notification and all the notifications would be combined. When notifications are combined, the counter would be increased too. 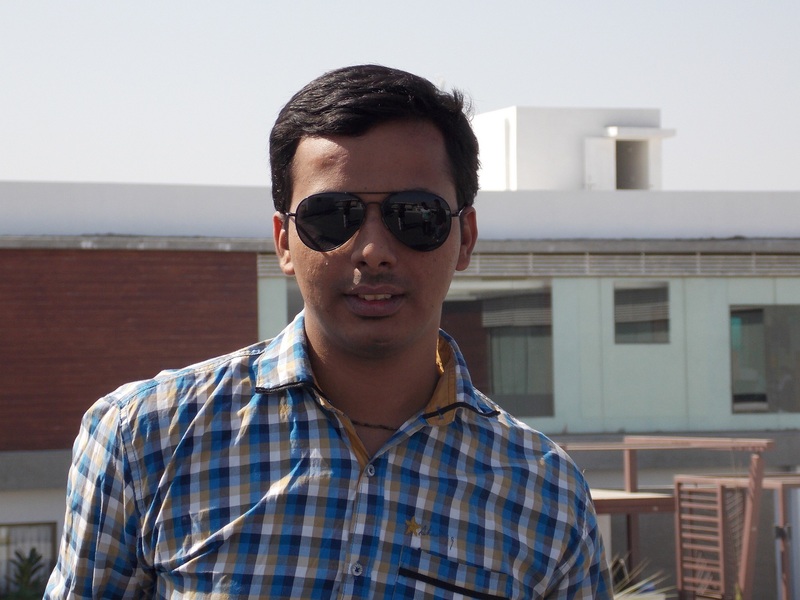 "I hope you find this blog post very helpful while Easy Send Local Notification To User In Android. Let me know in comment if you have any questions regarding Tab Layout. I will reply you ASAP."